I never told anyone, unless asked, about that one year gap in my college life. Nor did I volunteer the information on the years prior to that. Last year, we had our first reunion in Bahay na Tisa. Allan organized it. This year, Bobet created a Facebook event invite. During that time, I had my Facebook deactivated. He called to inform me, and requested help to find a venue. Due to time constraint, we opted to meet in Bahay na Tisa again. But Allan lost the contact number, so I had to google it. I called them and reserved for 20 people. Many clicked on Attending anyway. Still, many attended – Tsina, Allan, Bobet, Bullet, Dang, Jo, Cenen, Keyt, David, Mon, Pol, Nikki, Japs, MC, Jesson, Suzet, June and Maco. 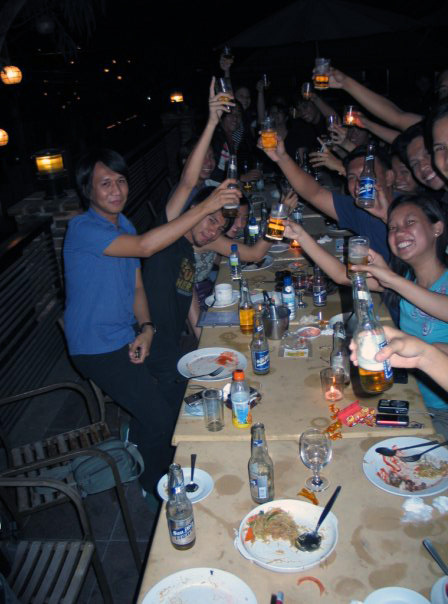 It was a night like the usual reunion/get-together – San Mig light, crispy pata, and lots of kwentuhan. I joined because when I was in high school, I used to get copies of the magazines/folio. I am a fan of Rhys Lloyd... Dahil sa Peys, I wouldn’t have missed a year. I would have said more. I would have reminded them the friendship - tambay sa peys, logbook, kwek-kwek, discussions, overnight, go/kill, mob. I would have let them know what they made me feel then - that somehow we could have done more. I guess, losing everything then wasn't enough. But I didn't. Somehow, the alcohol was not enough to let my feelings slip. at nalulungkot ako kase lahat gusto ko makasama... pero minsan la budget..minsan busy sila..minsan la time..
at ngayon 4th... umalis naman ako.napalayo ako sa lahat... at ang lungkot..
kapag nakikita ko lang sila sa peysbuk..naiisip ko.. sayang di ako kasama sa picture..
reunions uleh :) weee :) aheheh. everytime may reunion yung klase namin, palagi nalang akong di pwede. huhuh. nakakasad lang talaga. nwei, sarap ng san mig light!